Congratulations to IRG member and past president Allan K. Thurber (VE1RG) on being recognized with an Emergency Management Exemplary Service Award. Federal/Provincial and Territorial Ministers recognize the work being done across Canada to prevent, prepare for, respond to and recover from emergencies and disasters. 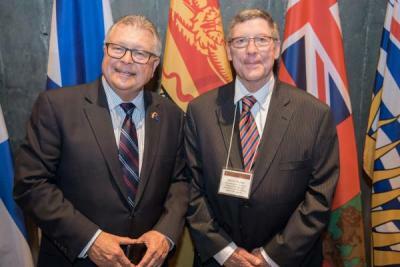 The award ceremony was held on May 24 in Ottawa, attended by nominees and was addressed by The Honourable Ralph Goodale, Minister of Public Safety and Emergency Preparedness. Mr. Thurber has been involved with New Brunswick Emergency Measures Organization (NBEMO) and the ham amateur radio operators since 1973. For more than 45 years, Mr. Thurber has been an integral communicator during emergencies throughout the province of New Brunswick, such as the 2017 ice storm in the northeast of the province of New Brunswick. Mr. Thurber's leadership and organization skills enabled NBEMO to communicate with emergency services during the province-wide communications blackout in August 2017. Mr. Thurber's dedicated volunteerism has shown great commitment to enhancing emergency communications capacity in New Brunswick. The Emergency Management Exemplary Service Award is a prestigious recognition for exceptional service and achievement. This award, a partnership between provincial, territorial and federal governments, recognizes recipients who have achieved excellence in their respective fields. Across Canada, there are many deserving individuals and groups working on emergency management, such as community-based volunteers, people working in all levels of government in emergency management organizations, and Indigenous communities. “Across Canada, there are many individuals and groups working hard to keep us safe who often go unnoticed. The recipients recognized today have not only achieved excellence in their field, they have helped keep us safe and resilient. I’m grateful to provinces and territories for their collaboration to recognize these leaders nationally for the first time, and look forward to working with them to award this prestigious honour to deserving individuals across Canada each year,” said Goodale. More information about the Award program is available at the Public Safety Canada website. The Point Lepreau Warden Service (PLWS) is a community-based, volunteer organization designed to alert the public within a 20 km radius from the Point Lepreau Nuclear Generating Station in the event of a radiation emergency with off-site implications. Under the direction of the New Brunswick Emergency Measures Organization, the Warden Service will assist the RCMP in notifying residents of the requirement to evacuate, where to report for registration and where to be checked for radioactive contamination. The Warden Service will also assist in determining which residents need transportation, including ambulances and specially-equipped vehicles. The Warden Service members provide a critical link to the community, are a key component of public alerting, and play an integral role in coordinating evacuations to ensure effective emergency management. Ms. Hulan, is a K9 handler on the Charlotte County Ground Search and Rescue (CCGSAR) team and is the only GSAR K9 handler in the province of New Brunswick. She has dedicated her time and energy to becoming a professional dog handler and works actively to help establish canine resources in the province. In addition, Ms. Hulan defends the need for quality search and rescue in her province. She is also an organizer in the AdventureSmart program, the secretary for her SAR team, a member of the Board of Directors for the New Brunswick Ground Search and Rescue Association, and the ground SAR representative at the Regional Emergency Operations Centre. Mr. Kavanagh has been a manager of Local Services District with the New Brunswick Department of Environment and Local Government since 1992. Mr. Kavanagh was involved with responses to many severe emergency flooding situations along the St John River on a regular basis. Mr. Kavanagh opened and managed operation centers in the Oromocto, Maugerville, Sheffield, and Jemseg area for deployment of assets and personnel for support in the 2008 floods and the Hurricane Arthur disaster of 2014. Mr. Kavanagh is an integral part of the emergency response in New Brunswick and has been critical in building capacity for emergency response in the province.